Having very few frog sightings lately. Today I did see Uptown Frog, albeit very briefly. He also saw me and quickly dove underwater. 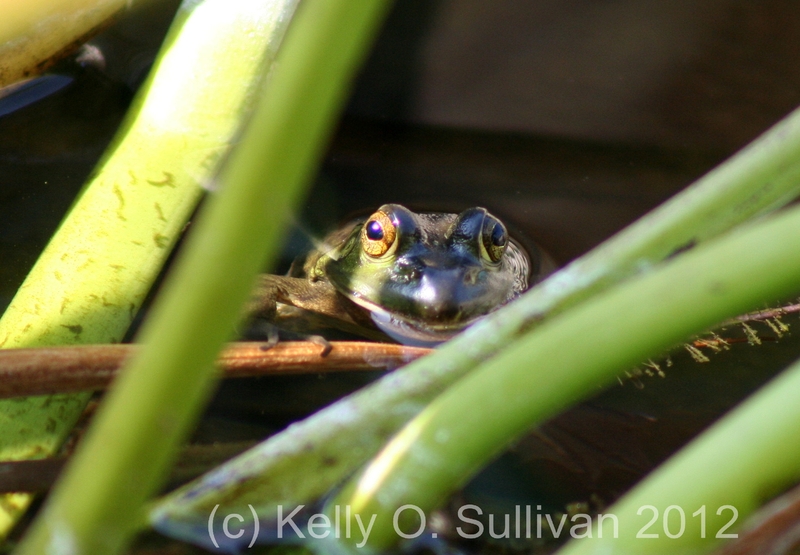 This made me decide it was time for another archive photo for a periodic frog. This is Cave Frog, with his beloved plant pot. It’s an earlier photo before I got a bit better at this, but I love how his little hands are hanging on to the edge of the pot. Cute! 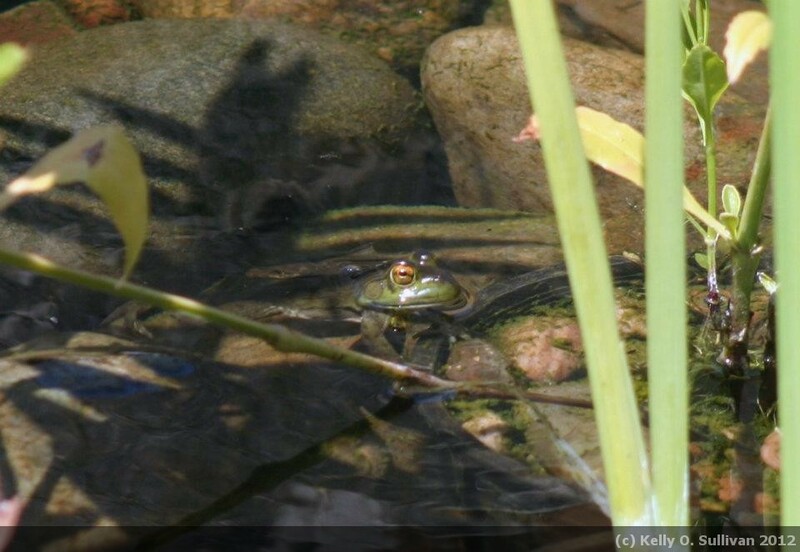 I see the occasional splash as one of the trio of frogs who still live in the pond dive under, but with the cooler weather it is rare to spot them at all, and I have had no chance to actually get a photo. So I went back to my archives to admire Brave Frog again. Such a charmer! I admit it – I do not think I can keep up daily postings much longer at all, so I’ve renamed this to “Periodic Frog” because (1) it’s going to be accurate and (2) I’m a chemist who enjoys the play on words. 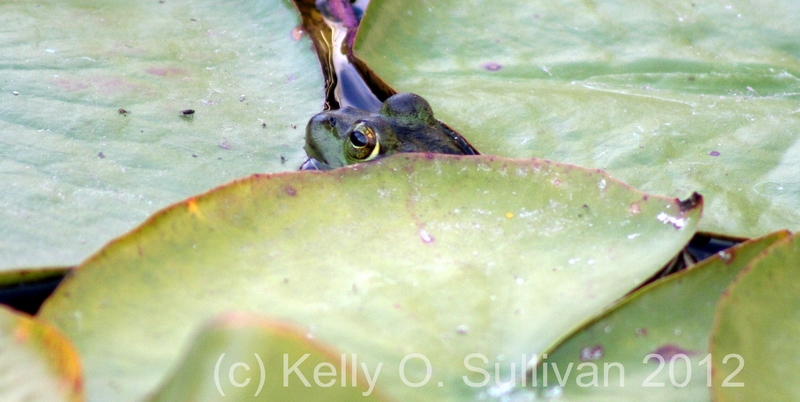 Nonetheless, I was delighted to spot Eyeballs in the lilypads – he was well hidden. I didn’t see him actually go for the little insect (perhaps it’s too small to bother with – what do I know? Do frogs do tapas?) but I like to think he was watching it. 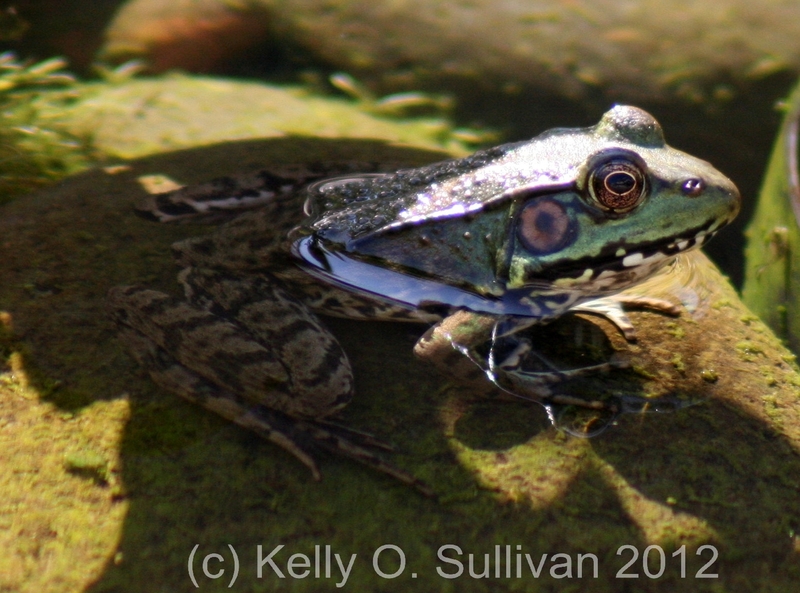 Those little bugs are annoying, so I’d be more than happy to have them be a frog’s appetizer. 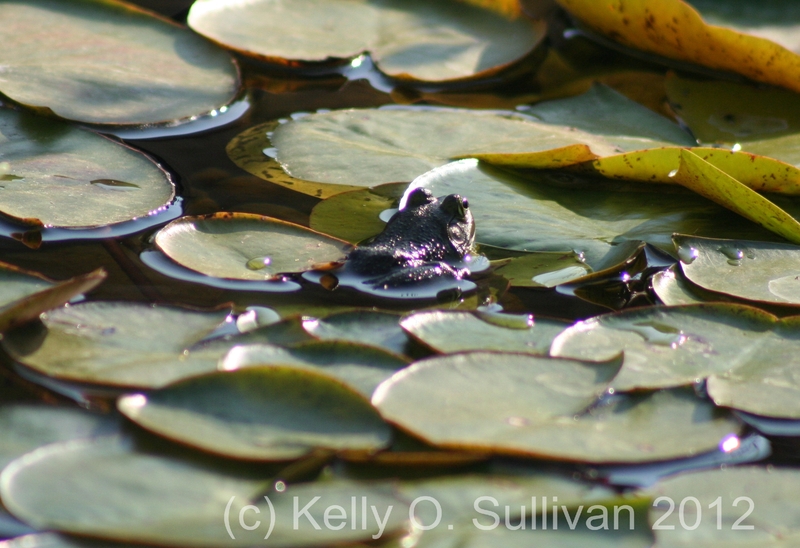 I am one with the lily pads. I was certain I had missed my opportunity to take a photo of Cave Frog on this evening – which would have been a shame as the light was interesting on the water. 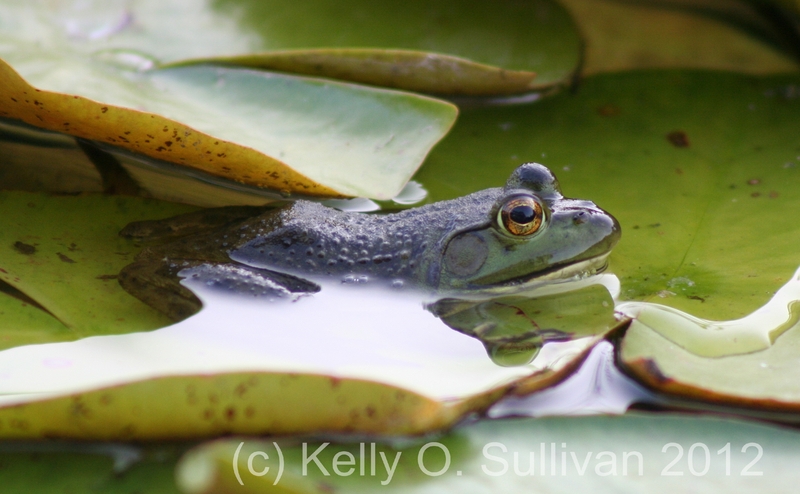 While I was moving in, he hopped off the lily pad where he had been sitting – but thankfully they are so thick there he just ended up on another, with one over his back. He must have felt reasonably camouflaged, because he was then very still while I did the photo shoot. I need to be more observant when I go out my door – the spot where Uptown Frog lives is very close and I’m beginning to think he is watching me more often than I am aware. Be sure to click on the photo to get the large size, and take a look at his arm under water, fingers holding on to the plant stalk. Where he is there is a reasonable current – so holding on is the only reason he isn’t floating downstream. Could someone please tell me why Cave Frog picks a certain spot? Given all the choices, I wonder what made this one the best of all? Regardless, he seemed like a very content frog on a nice sunny afternoon.